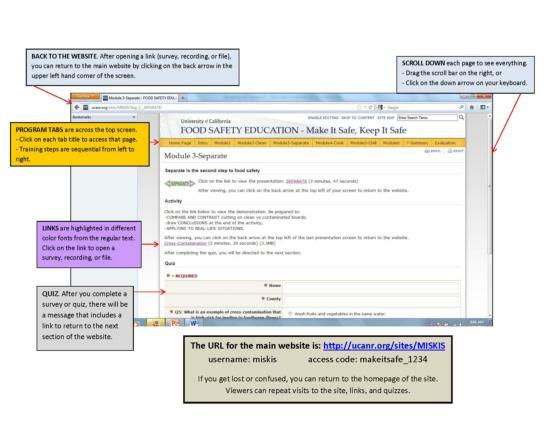 The field-testing period for the components for the upgraded online food safety training has ended. The purpose of the field-testing was to gather feedback from staff and volunteer participants to inform the final version of the curriculum for enhanced version, which is forthcoming. Meanwhile, this private site remains open to participants with access info provided by county staff. Post-test scores will be given to county staff for certification of participants. The curriculum is divided into sequential modules from left to right across the program tabs, followed by a Summary and Certification. The general design of the program pages includes a presentation with core concepts, activity presentations, handout links, and additional information. To access files within the pages, click on the links, which are highlighted in a different color font. If opening a link is a problem, you may need to try again later. For viewing, you will need to have Flash installed in their computer. It needs to be installed only once. For the first time on a computer, you may get a prompt to install it. If you have viewed You Tube on your computer, Flash is already installed. To hear the audio of each presentation, be sure to turn on your speakers, and adjust the volume according to your needs. To test your knowledge, there are two tests: pre-test and post-test, both of which are accessible as links. At the end of each test, there is a message with a link to take you back to this site. While in the site, you may get a prompt to re-enter access info. We apologize for this inconvenience. Participants do not have to take the training in one session, but upon return, will need to navigate to the point where they previously stopped. Thank you for participating in this study, and for supporting food safety education! minimize the risk of foodborne illness. The curriculum is available via two deliveries, on-site by a UCANR trainer, or online through this site. Restaurant reopens after foodborne illness outbreak with employees and customers.